We have Wi-Fi, we have NFC, we have dedicated applications - so what's the next step in event connectivity? A head mounted display for every attendee? A watch-like device which thinks it's a phone? Perhaps in the future, but for 2013 we have the proximity beacon - used for the first time to track the movement of attendees at Qualcomm's annual Uplinq conference in San Diego . Upon registration every attendee has the option to pick up a Gimbal Proximity Beacon which is linked to their account and allows the mothership to determine your location when you're in the vicinity of a receiver - which can take the form of a mobile phone, tablet or dedicated, plug-in device. 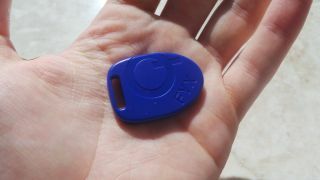 The plastic beacon itself is pretty small, fitting snugly into the palm of the hand. It's also incredibly light. You won't notice it in your pocket or attached to the lanyard around your neck. There's a small battery inside to power the Bluetooth LE (low energy, AKA Bluetooth 4.0) broadcast system, and the device can send various bits of information to a receiver including an identifier (i.e. your name), the battery level of your unit and even ambient temperature. As well as feeding data back to Qualcomm on the whereabouts of its various attendees, the system is also linked up to a mobile application which can send each person notifications, deals and offers when they trigger particular receivers. Integration with the app goes further at the Uplinq conference, with the Beacon automatically checking people in to various sessions. A list of people currently present is relayed to the application so you can see who else is in the room with you, because using your eyes is so 2012. While a data connection is required to view such information on your mobile phone, your mobile doesn't need to have a connection - or even be on - for the auto check-in system to work. This means there's no dependence on your mobile's battery life (increasingly important these days), and the battery inside the beacon can last up to three months - depending on the usage it's set up for. The receivers themselves can be fine-tuned to create geo-fences in certain areas, and ranges can be tweaked from 1m to 50m, and even up to 100m in open spaces. There are obvious advantages here for Qualcomm, as it can track which panels are best attended and by who, and which aren't - giving it key feedback for next year's event before asking anyone to fill out a survey. Now Qualcomm assures us it's anonymising all the data it collects via the proximity beacon so it won't be able to track individuals, and if at any point someone doesn't want to be tracked they can opt out, with the option to delete all data collected on them so far too. The Gimbal system isn't just for Qualcomm's benefit.There's a whole SDK available to developers allowing them to create applications for numerous use case scenarios which interact with the system - such as allowing restaurants and shops to offer discounts to passers-by.